Gatherings at East Greenwich is a charming community in Clarksboro, New Jersey that is restricted to residents aged 55 and better. This beautiful community contains many exciting amenities including a clubhouse, fitness center, outdoor pool, tennis and bocce ball courts and much more. Gatherings at East Greenwich has many social events to give residents many opportunities to get to know their neighbors. The surrounding areas include the perfect mix of historic districts, modern-day suburban centers and beautiful natural settings. Gatherings at East Greenwich features a charming clubhouse that is the hub for social events and activities. Residents can stretch and tone in the fitness center or play cards in the game room. Outdoors, residents can swim a few laps in the pool or lounge on the patio. Challenge your neighbors on the bocce ball and tennis courts or enjoy a brisk job on the walking and biking trails. Gatherings at East Greenwich residents also have access to a gazebo that overlooks a beautiful pond. Residents in this 55+ community have many options to stay active and keep in shape. Designed with active adults in mind, Gatherings at East Greenwich includes homes that appeal to a variety of homeowners aged 55 or better. Beazer Homes began constructing these beautiful single-family homes in 2010 and upon completion it will consist of 161 homes. Homebuyers can choose from eight different floor plans that range in size from 1,457 to 2,217 square feet. Homes feature two to four bedrooms, two to four bathrooms and an attached two-car garage. Each plan also includes a second-floor loft, which could be used as an extra bedroom and basement options. Gatherings at East Greenwich homes have distinctive exteriors, which include low-maintenance vinyl siding, 30-year architectural roof shingles, front and rear exterior light fixtures, and insulated double-pane Low-E windows. Interior features include nine-foot ceilings throughout the main floor, distinctive colonial six-panel interior doors, and water-saving plumbing fixtures. At Gatherings at East Greenwich, residents can enjoy a beautiful setting, which includes high-quality, low-maintenance homes and plenty of community amenities. Tennis, bocce ball, and card games are just a few of the activities available at the clubhouse. Planned activities allow residents to make their social life as full as they wish while exploring both new and long-held interests. There are a variety of ways to stay fit while living at Gatherings at East Greenwich since residents can condition in the fitness room, play a match on the tennis court, or run or bike the trails surrounding the community. Gatherings at East Greenwich also hosts several social events to keep residents busy, such as barbecues, holiday parties, and soup nights. With a homeowners' association fee that covers snow removal and lawn maintenance, residents of Gatherings at East Greenwich will have plenty of time to pursue their hobbies and interests. Whether you want to stay in shape, meet new neighbors, or find a new favorite read in the book club, Gatherings at East Greenwich can provide. 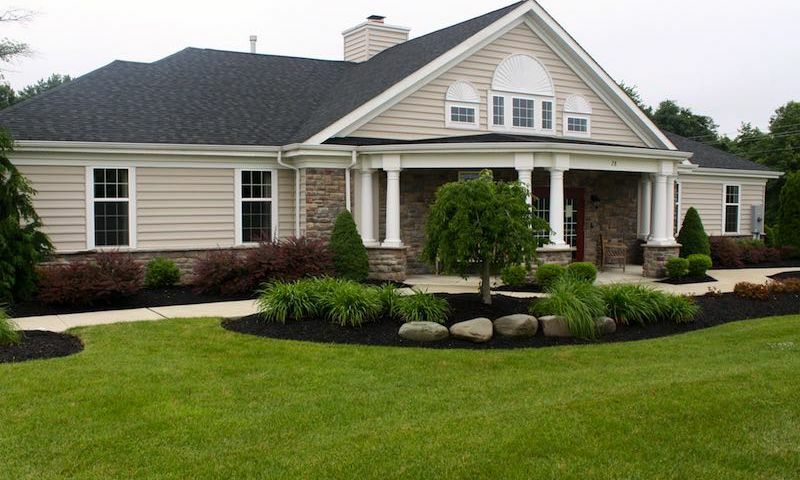 Gatherings at East Greenwich is located in Clarksboro, New Jersey in Gloucester County. It is conveniently located near both Route 295 and the New Jersey Turnpike. This prime location makes traveling to New York City and Philadelphia a breeze. For farther travel, the Philadelphia International Airport is about 20 miles away. Just ten miles from the community entrance is the Riverfront Medical Center. The area surrounding Gatherings at East Greenwich offers great restaurants, shopping, outstanding health care facilities, and educational opportunities. Just five miles away are several shopping centers that include a K-Mart, Homes Depot, and other stores for everyday conveniences. Golf enthusiasts will love the many golf course options nearby. With activities and recreation both inside and outside of the community it is easy to see why Gatherings at East Greenwich is a sought-after active adult community in Clarksboro, New Jersey. There are plenty of activities available in Gatherings at East Greenwich. Here is a sample of some of the clubs, activities and classes offered here. Homebuyers can choose from eight different floor plans that range in size from 1,457 to 2,217 square feet. Homes feature two to four bedrooms, two to four bathrooms and an attached two-car garage. Each plan also includes a second-floor loft, which could be used as an extra bedroom, and basement options. Gatherings at East Greenwich homes have distinctive exteriors, which include low-maintenance vinyl siding, 30-year architectural roof shingles, front and rear exterior light fixtures, and insulated double-pane Low-E windows. Interior features include nine-foot ceilings throughout the main floor, distinctive colonial six-panel interior doors, and water-saving plumbing fixtures. 55places.com is not affiliated with the developer(s) or homeowners association of Gatherings at East Greenwich. The information you submit is distributed to a 55places.com Partner Agent, who is a licensed real estate agent. The information regarding Gatherings at East Greenwich has not been verified or approved by the developer or homeowners association. Please verify all information prior to purchasing. 55places.com is not responsible for any errors regarding the information displayed on this website.